I snuck across the border at Dawn and paid my very reasonable greenfee of £25. Set out in the vast grounds of an 18th century Grade 1 listed pile you find a rather charming and enjoyable golf course. Some of the holes are very tight, some have vast expanses of meadow where you can hit it anywhere. Never the less it was fun and in very good condition. As my closest option for Summers in Rybnik it is certainly good enough to keep my eye in and flattering enough to keep my tail up. 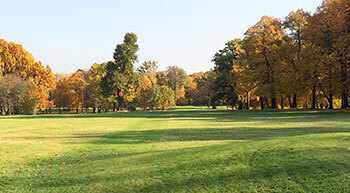 Park Golf Club Ostrava (Silherovice) is one of the traditional Czech (actually Silesian, founded 1968) courses, a championship parkland layout on premises of the former Rothschild’s castle. The castle and surrounding park were built between 1787 and 1820. Low, piercing shots bellow overhanging branches of the centuries old oaks, beeches, plane and fir trees are essential. Course is in excellent shape and real enjoyment to play, with many strategic holes. To keep the ball in-between the trees on the left and right is a must namely on the short par 4 6th. The most rewarding are par 5s 8th and 15th, winding smoothly through the castle park, both great scoring holes. The only disturbing part of this fabulous golfing experience is the old clubhouse, I believe unchanged since the past communist times in this country.